From the Department of Neurology (A.C., P.A. ), Department of Infectious Diseases (A.S.-P., J.A., N.N., A.S.), Centro Hospitalar São João, Porto, Portugal; Department of Neuroscience and Mental Health (A.C., P.A. ), Faculty of Medicine of University of Porto, Portugal; Nephrology and Infectious Diseases R&D Group (A.S.-P., J.A., N.N., A.S.), Health Investigation and Innovation Institute (I3S), University of Porto, Portugal; and Neuroimmunology Program (E.M.-H.), Institut d'Investigacions Biomèdiques August Pi i Sunyer (IDIBAPS), Barcelona, Spain. A 57-year-old Caucasian man with no clinical history of interest returned to Portugal after a long stay in rural Angola. Fifteen days before returning to Portugal, he had visited a tropical forest region in the North of Angola. Five days after returning, he experienced fever, asthenia, dizziness, and myalgia. He was diagnosed with Plasmodium falciparum malaria (8% parasitemia), with no severity criteria according to the World Health Organization guidelines.1 He was successfully treated with IV quinine-doxycycline and discharged home 11 days after fully recovered. Two weeks later, the patient developed fever, apathy, somnolence, sleep-awake cycle disruption, confusion, and altered behavior, progressing for 7 days. On examination, he was febrile but hemodynamically stable. A mild macular rash in the trunk and a nonpainful, nontender mass in the posterior cervical region were noted. He was disoriented in time and space, had severe attention deficit, acalculia, and visuospatial difficulties. Blood laboratory tests showed mild hypochromic anemia, with no further abnormalities. No Plasmodium parasites were found in the thin blood smear. Brain CT was normal, and the CSF study showed 159 cells (91% mononuclear), protein 2.12 g/dL, normal glucose CSF/serum ratio, and normal IgG index. EEG was consistent with a severe subcortical encephalopathy with no epileptic activity. 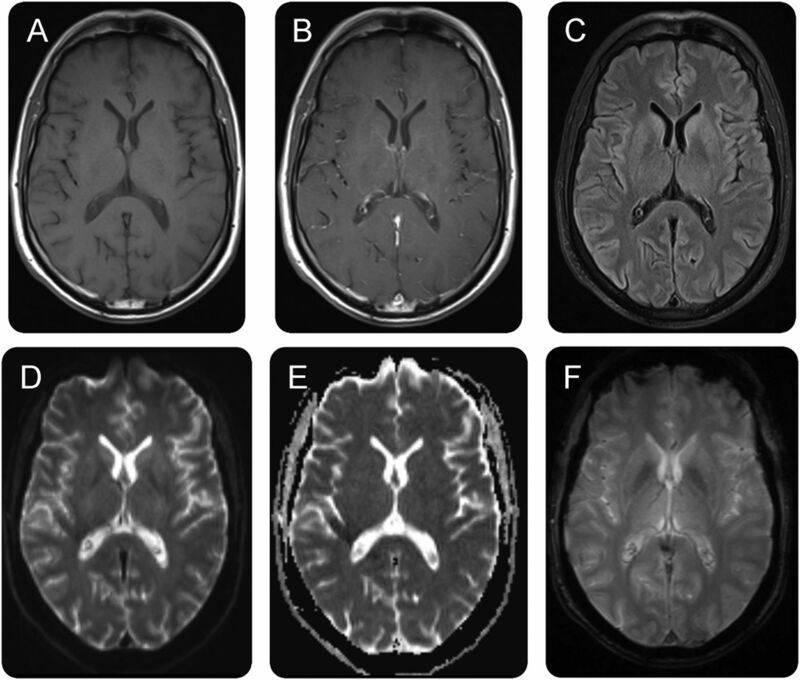 Brain MRI showed a mild increase of T2/fluid-attenuated inversion recovery signal in the caudate-capsule-lenticulate regions with no gadolinium enhancement (figure). Extensive serum and CSF studies were negative for active infectious (table) or systemic autoimmune causes (negative antinuclear antibodies, anti–neutrophil cytoplasmic antibodies, anti–double-strand DNA, anti–extractable nuclear antigens, rheumatoid factor, anti–amphiphysin 1, anti-CV2/CRMP5, anti-Ma2, anti-Ri, anti-Yo, and anti-Hu antibodies in serum). Mild increase of T2/fluid-attenuated inversion recovery (FLAIR) signal in the caudate-capsule-lenticulate regions with no gadolinium enhancement. (A) T1, (B) T1 with gadolinium, (C) T2 FLAIR, (D) diffusion-weighted image, (E) apparent diffusion coefficient, and (F) gradient echo. Neurologic symptoms progressed for the next 8 days, and postmalaria neurologic syndrome (PMNS) was diagnosed. A 5-day course of 1 g IV methylprednisolone resulted in a significant clinical improvement. A follow-up CSF study showed 34 cells, protein 1.7 g/dL, normal glucose CSF/serum ratio, and no oligoclonal bands. The patient was discharged on day 15, asymptomatic. Patient samples were sent to a neuroimmunology referral center (Professor Josep Dalmau Laboratory, Neuroimmunology, IDIBAPS, Barcelona, Spain), which showed the presence of neurexin-3α antibodies.2 The presence of cell surface/synaptic neuronal antibodies was determined by rat brain immunohistochemistry, which showed a distinctive pattern of serum and CSF reactivity with neuropil of rat brain that was different from other previously known antibodies, and by specific cell-based assays, which confirmed positive serum and CSF reactivity with human embryonic kidney 293 (HEK293)-expressing neurexin-3α, and negative reactivity with HEK293 expressing the NMDA, AMPA, GABA-A, GABA-B, mGluR1, and mGluR5 receptors, or LGI1, Caspr2, DPPX, and IgLON5 proteins. A new form of autoimmune encephalitis associated with neurexin-3α antibodies was recently described in 5 patients.2 One of them may have had a history of malaria a few months before developing autoimmune encephalitis (patient 1 of Gresa-Arribas et al.2). This patient, a 23-year-old Caucasian woman, presented with a 2-week history of worsening headache, somnolence, disorientation, confusion, and recent memory problems. Two months before, she had returned from a 6-month trip to Tanzania. During her stay in a rural area in Tanzania, she had 2 episodes of fever which had been treated as malaria (despite no microbiologic confirmation). On admission, she was disoriented in time and space, with emotional lability, short-term memory deficits, and confabulations. Blood smear test was negative for parasites. Transient leukopenia and thrombocytopenia were detected in blood tests. CSF showed 20 cells with normal protein and glucose; brain MRI was normal; and EEG showed slow activity on left posterior temporal areas. Extensive microbiologic studies were negative in blood and CSF. She was treated with IV methylprednisolone with improvement. We report here another patient whose neurologic symptoms were confirmed preceded by malaria and who had a rapid improvement after steroid treatment. PMNS was first described, mainly in adults after recovery of severe falciparum malaria, in 1996 in Vietnam.3 There are some previous descriptions of delayed cerebellar ataxia following malaria in India and Sri Lanka.4,5 The clinical picture of PMNS is characterized by neuropsychiatric manifestations, including confusion, altered behavior, decreased consciousness, hallucinations, and seizures. The neurologic syndrome is self-limited, and no specific treatment is required, although in severe cases steroids may be beneficial.6 Immune-mediated mechanisms have been postulated in this postinfectious diffuse encephalopathy, but no autoantibodies had been previously reported. The case reported here suggests that encephalitis associated with neurexin-3α antibodies can potentially manifest as postinfectious encephalitis. Recognition of this disorder is important because it responds to immunotherapy. Similar investigations are worth to consider in patients with malaria and especially in patients with PMNS to further elucidate the relationship between these entities. Acknowledgment: The authors thank Professor Josep Dalmau for the scientific contribution to the manuscript. Author contributions: A. Costa and A. Silva-Pinto: clinical management of the patient, description of the clinical case, and elaboration of the manuscript. J. Alves: clinical management of the patient, especially regarding Trypanosoma exclusion, and revision of the manuscript. N. Neves: clinical management of the patient and revision of the manuscript. E. Martínez-Hernández: laboratorial workout, description of the laboratorial techniques, and revision of the manuscript. P. Abreu and A. Sarmento: study concept and critical revision of the manuscript for intellectual content. Study funding: This study was not funded. Disclosure: A. Costa, A. Silva-Pinto, J. Alves, and N. Neves report no disclosures. E. Martinez-Hernandez received research support from Instituto de Salud Carlos III. P. Abreu received speaker honoraria from Biogen, Bayer, Novartis, Sanofi Genzyme, Merck Serono, and Boehringer Ingelheim and consulted for Biogen and Bayer. A. Sarmento reports no disclosures. Go to Neurology.org/nn for full disclosure forms. The Article Processing Charge was funded by the authors. Accepted in final form July 3, 2017. Guidelines for the Treatment of Malaria, 3rd ed. World Health Organization: Geneva; 2015.
. Human neurexin-3alpha antibodies associate with encephalitis and alter synapse development. Neurology 2016;86:2235–2242.
. Post-malaria neurological syndrome. Lancet 1996;348:917–921.
. Delayed cerebellar ataxia complicating falciparum malaria: a clinical study of 74 patients. J Neurol 1994;241:456–459.
. Delayed cerebellar ataxia–a complication of Plasmodium falciparum malaria. J Assoc Physicians India 1996;44:686–688.
. Post-malaria neurological syndrome: a case report and review of the literature. J Trav Med 2009;16:424–430.